"Take responsibility for what you've done!" In Japan, this 1978 film was originally titled Kichiku, which, as the liner notes indicate, "is made up of the Japanese characters for 'demon' and 'livestock'." 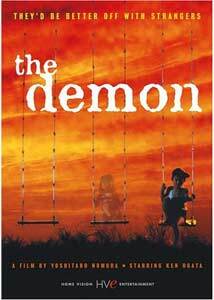 The initial disparity between those two words largely vanishes when watching what western audiences know as The Demon, a title that may at first bring to mind some kind of flaky horror film, full of badly latexed monsters and demonic possession. The reality of the matter is that The Demon is indeed a horror film of sorts, but one that is filled with the scariest monster of all: Man. Directed by Yoshitaro Nomura (The Castle of Sand, The Incident)—and based on a novel by Seicho Matsumoto—The Demon stars Ken Ogata as the title character, a hard-working printer named Sokichi, who is married to the very bitter and shrill Oume (Shima Iwashita). Trouble for Sokichi arises when his mistress of seven years (Mayumi Ogawa) shows up on his doorstep, with his three young children (six, four, and infant) in tow, demanding more support money. Understandably, this revelation pushes the already wiggy Oume over some emotional edge, and the situation is further aggravated when the mistress decides to take off in the middle of the night and leave the children in the care of Sokichi and his wife. It is important to note the film's tagline, "They'd be better off with strangers," because though the mistress seems to want to punish Sokichi, in reality she is putting her children's lives in jeopardy. Ogata's Sokichi is mercilessly harangued by Iwashita's Oume, and when the added stress of simply caring for three children becomes too much, the pair develop a horrible plan to permanently rid themselves of their perceived new burden. With its obvious parallels to Hansel and Gretel, Nomura's film also takes on the issue of child abandonment that was, and apparently still is fairly prevalent in Japanese culture. As the title character, Ogata is not simply an entirely evil man, but instead an emotionally torn whipped dog to Iwashita's icy harridan, but their actions together are still brutally cold and horrific. Nomura unravels the events in The Demon slowly, building and compounding the tension, and actually allowing Ogata to seem almost compassionate to a point, until we are slapped in the face with just how bad he can be. The Demon is an extremely heartwrenching film to watch, and one that dares to make unthinkable actions real. Ogata, however, delivers an intensely agitated performance as the confused Sokichi, and Nomura builds to an appropriate payoff that is grounded enough to know that in a story like this, there can never really be a happy ending. Image Transfer Review: Home Vision has come up with a gorgeous transfer on this 25-plus-year-old film, this time in 1.85:1 anamorphic widescreen. The print itself is quite clean, with sharp image detail and colors appearing exceptionally bright, so much so that it looks like it could have been made yesterday. No compression issues to contend with either. Just an all around nice-looking disc. Audio Transfer Review: Audio is available in a hiss-free Japanese language mono track. It is an average, if not unremarkable, presentation, though the presence of moderate clipping is evident occasionally. Extras Review: Extras featured here are minimal, with filmographies for Ken Ogata and Yoshitaro Nomura, a theatrical trailer (as well as one for the series) and a two-page insert written by Patrick Macias explaining a bit of the film's history. The disc is cut into 18 chapters, with optional English subtitles. This is a profoundly disturbing and equally suspenseful film from one of Japan's most prolific directors, Yoshitaro Nomura. The subject matter is grim, but the presentation and acting (especially Ken Ogata) is first rate.